I graduated from the University of Bristol in 1995 as top of my year, and came to work at Fairfield in September of that year. I have been here ever since. In 1999 I gained my certificate in small animal internal medicine, and am now a RCVS recognised advanced practitioner in internal medicine. 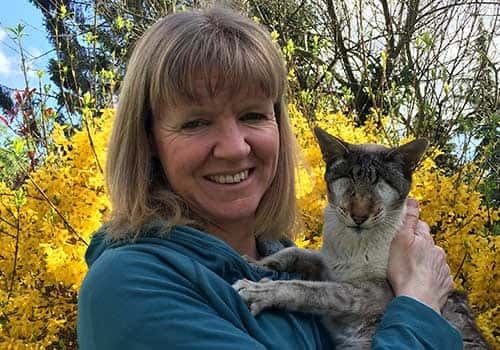 I have a particular interest in feline medicine, and have recently driven forward the practice’s initiative to become an ISFM (International Society of Feline Medicine) recognised cat-friendly clinic. I have numerous pets. My Labrador “Sonic” competed at agility for a number of years, qualifying for Cruft’s finals in 2013. I have 2 cats – Ernie – my elderly Siamese – lost both his eyes due to glaucoma, but still has a great quality of life. I hand reared “Indie” – my “moggy” – from 1 week of age after he was brought into the practice by a member of the public having been found abandoned before his eyes had even opened! I also recently acquired 2 rabbits as pets for my youngest son, which has sparked an interest in rabbit health and welfare. Outside of work I spend much of my time playing “taxi-driver” to my 2 sons, taking them to various sporting and musical activities that they are involved in. I am also a keen triathlete, and train regularly for this. I have competed a number of triathlons of varying distances, up to Half-Ironman level, and regularly run half marathons.